| Safari | — Kiliwarrior Expeditions - Climb Kilimanjaro and become a Kiliwarrior! All our safaris are custom made and designed to meet all budgets and levels of comfort. Let us design a custom safari for you, starting as little as 1 day. Maasai people and the wildlife of Tanzania's National Parks. us design a safari to let you Experience the Unbelievable. Serengeti Plains: Endless grassland of the south. Northern Serengeti: Open woodlands ,bushy savanna. Serengeti National Park is located 335 km. (208 Miles) from Arusha, stretching north to Kenya and bordering Lake Victoria to the west. Serengeti Plains: Wildebeest, zebras, gazelles, buffalo, impalas. Western Corridor: Nile crocodiles, martial eagles and colobus monkeys. Northern Serengeti: Wildebeest, zebras, elephants, giraffes. Ngorongoro is a conservation area and a UNESCO World Heritage Site since 1979. The main feature of the Conservatory includes the Ngorongoro Crater. The crater itself is 600 meters (2,000 ft) deep and covers an area of 300 square kilometers (100 square miles). The area is part of the Serengeti ecosystem, and to the northwest, adjoins the Serengeti National Park and is contiguous with the southern Serengeti plains. The southern and eastern boundaries are approximately defined by the rim of the East African Rift wall, which also prevents animal migration in these directions. The Conservatory Area is located 180 km (110 miles) west of Arusha. Ngorongoro Crater has approximately 25,000 large animals that live in the crater, including one of the densest known population of crater lions. Covers an area of 2,850 sq. kilometers (1,100 sq. miles). It consists of a hilly landscape, dotted with dense bush and high grasses. There is also an area called "Little Serengeti", whose landscape resembles its much older cousin, Serengeti National Park. Thousands of animals will migrate to Tarangire National Park during the dry season (June to September) in search of water to found in the Tarangire River. The park is 118 km. (75 Wles) southwest of Amsha. Tarangire National Park is a great way to get an authentic safari adventure within a one to two day timeframe. It can also act as a gateway to the Serengeti National Park or combined with Lake Manyara National Park. Tarangire National Park is famous for its large herds of elephants congregating along the river bed. You can also see their famous tree climbing lions and leopards. It is easily the greatest concentration of wildlife outside the Serengeti. During the rainy season (November to June), the swamps are filled with over 500 species of birds ready to breed. It is one of the most heavily populated breeding habitat in the world. Ostriches and the Kori Bustard can also be seen. Stretches 50 km along the base of the Rift Valley escarpment. The park consists of 330 sq. km (130 sq. miles) of lush jungle-like forest to grassy floodplains. 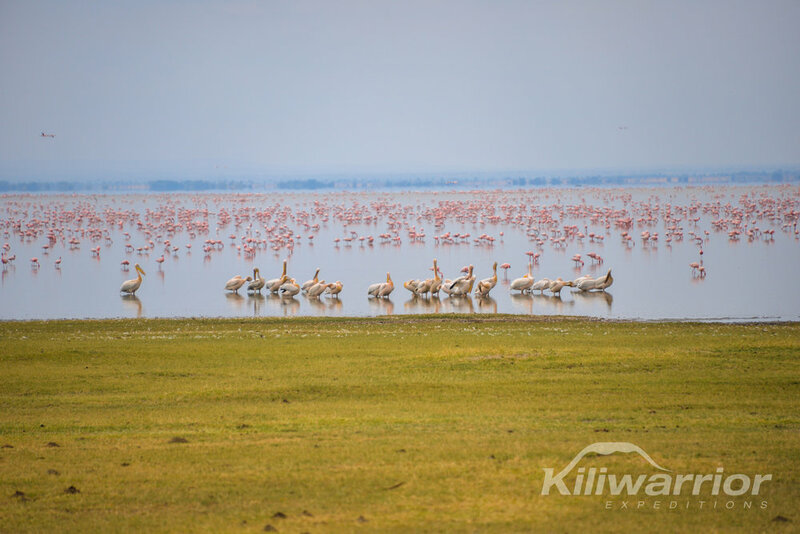 Lake Manyara is an alkaline lake, that covers over 200 sq. km (77 sq. miles) of the park during the wet season (November to June) and attracts over 400 species of birds. Visitors can easily expect to see over 100 species of birds on any given day. The park is 126 km (80 Mile) west of Arusha, though the main gate is 25 km east of the city. It is also 58 km from Moshi and 35 km from Kilimanjaro Int'l. Airport (JRO). Lake Manyara National Park is a great way to get acquainted with the adventure of a safari. A one to two day visit will give you a taste of a safari and as a gateway to the Tarangire, Serengeti or Ngorongoro Conservatory Area. Lake Manyara offers a great introduction to Tanzania's birdlife.